Small Cap stocks roared back in 2016, after two years of tepid performance and a slow start to the year. The segment as represented by the Russell 2000 small-cap index (IWM) gained +20%. This compared with the large-cap S&P 500 (SPY) gain of +10%, a Nasdaq (QQQ) gain of +8%, and Dow Jones Industrials (DIA) gain of +13%. 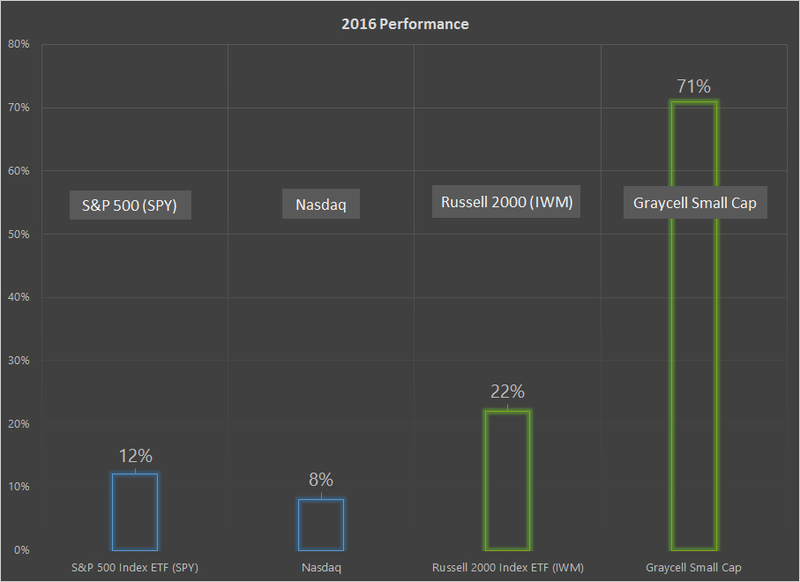 The Graycell Small Cap Model Portfolio closed the year 2016 with a gain of +71%. Small Cap stocks are generally defined as companies with a market capitalization (market cap) of between $250 million to $2 billion. The Russell 2000, considered the key small cap benchmark by mutual funds, takes the smallest 2000 companies within its Russell 3000 index. Consequently, the average market cap and its range change each year, when the Russell 2000 index is rebalanced in June. The 2016 market cap range at the time of reconstitution was from $130 million to $3.9 billion. But, it is not surprising to find some stocks in the index with a market cap of $5 billion or much higher as a result of appreciation during the year. The weighted average market cap of a company in the Russell 2000 index is around $1.25 billion. For the Graycell Small Cap portfolio, we use a market cap range of $250 million to $3 billion. There has been sufficient research over the years which has provided empirical evidence of small cap outperformance over time on both an absolute and risk-adjusted basis. The work of Nobel laureate Eugene Fama, often referred to as the Father of Finance, has often cited the outperformance of small-cap companies compared to large-cap. The Capital Asset Pricing Model (CAPM), the foundational modern finance theory with one of the originators being Nobel laureate William Sharpe, posits that the Beta alone can explain the stock's average return. Dr. Fama's work with Dartmouth Professor Kenneth French, postulated a new theory, referred to as the 3-factor model, which propounded that 2 other factors beyond the Beta can more effectively and completely explain a stock's return - the Market Capitalization and Value. The Market Capitalization refers to the tendency of small caps to outperform large caps, while Value refers to the tendency of value stocks to outperform growth stocks over time. The small cap outperformance of larger caps to an extent depends on time frames, whereby in some periods small caps may outperform while underperforming in others. However, when measured over an extended period of time, the small cap outperformance is abundantly clear and consistent. If investors are willing to bear the additional volatility and periodic underperformance in the short-term for small cap stocks, then over the long-term they are well compensated for the additional risk, compared to other financial market investments. The additional risk is from the emerging nature of small caps which means unproven products, relatively limited access to financial markets, and the ability to survive, being a few such risks. In addition, the stocks underperform the larger caps during a period of faltering economic growth and recession. Unfortunately, an investor simply can't rinse off the small cap risk, while just expecting the higher return. Consequently, a prudent small cap portfolio approach must be considered to overcome some of the unique risks. The chart below demonstrates the growth of a single dollar invested in the stock market in 1929 and its investment performance all the way till 2015. The performance of Small Caps makes a compelling case for portfolio allocation. Small caps tend to do well when there are expectations for improving economic growth. This leads to a higher risk tolerance and consequently improving risk appetite for speculative investments. That is the scenario the market has been witnessing and continues to do so into 2017. The three pillars of stock market valuation, Economy, Earnings, and Monetary Policy continue to remain in alignment for supporting higher valuations. This was discussed in greater detail in the article, "Still Waiting For A Correction? Market Outlook For 2017." As long as these pillars remain supportive of valuations, the risk-tolerance will remain high, which will assist small cap stocks, as represented by the Russell 2000 and S&P 600 (SLY), to continue pushing towards new highs. 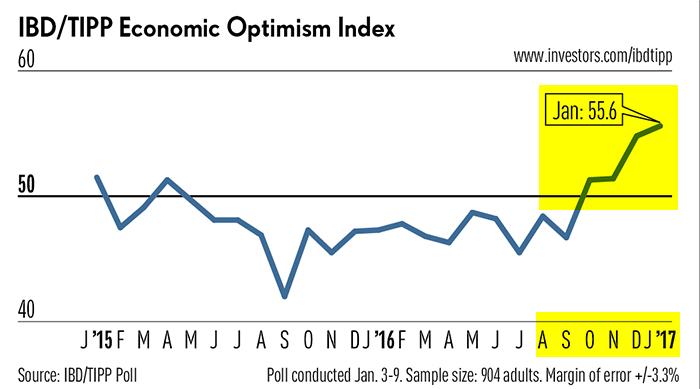 The IBD/TIPP Economic Optimism Index is at a multi-year high, along with many other confidence indicators discussed in the Market Outlook 2017 article. This bodes well for the economy, which is poised to ratchet up, and so should the small caps. The enduring power of small caps must be considered seriously by investors in their portfolio allocation decision. The additional return can make a very substantial impact over the long term, as conveyed by the $1 Growth chart above, which also underscores how long-term investors are rewarded for their patience. It is vitally important to build a portfolio of small caps to manage the risk prudently as opposed to investing in 1 or 2 stocks. Be prepared for volatility for that is inherent in the stock market and even more so in small cap performance, particularly in risk-flight markets. Once an investor has taken care of managing the downside, as much as is practically possible, the upside takes care of itself over time. Our return over many years in the small caps has been based with that in mind, and it has served us well. We believe the small cap rally should continue this year. 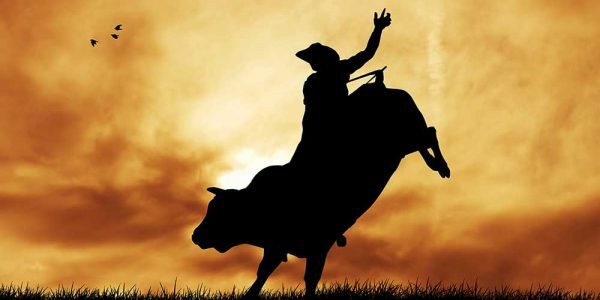 There are a number of promising small cap companies across many industries, including Clovis Oncology (CLVS), Resolute Energy (REN), Clayton Williams Energy (CWEI), Array Biopharma Inc (ARRY), Kemet (KEM), Achaogen (AKAO), Pier 1 Imports (PIR), Atwood Oceanics (ATW),Mechel Oao (MTL), CVR Energy (CVI), Fairmount Santrol (FMSA), and Navistar (NAV), to name a few. Small-cap exposure can also be acquired through ETFs like iShares Small Cap , iShares Growth (IWO), and iShares Value (IWN). The Graycell Small Cap Model Portfolio may presently or in the past own some or all of the stocks mentioned in the article. Please point out any errors or share your viewpoint below in the Comment section. The article can be read here on Seeking Alpha.